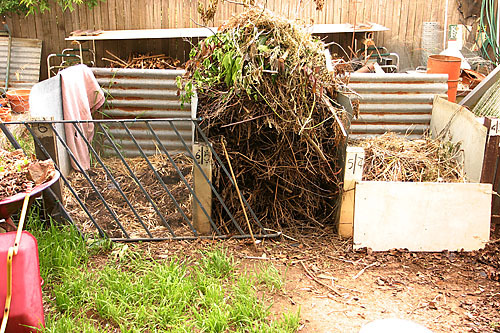 Time for some news from the garden front, and where better to go than the compost piles! We have many and nearly everything that could possibly go on them, does. I have a phobia about taking stuff to the dump when it could be used within our little territory at home. Our recycling bin is often full, but our rubbish bin only ever has two small bags of rubbish each week, the rest is re-used. 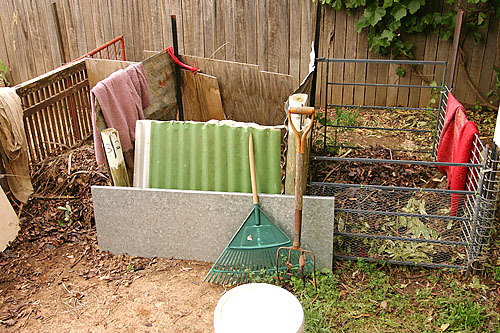 We try to keep the chooks out of most piles, but let them have a scratch about in some. The overloaded pile is the “sticky” pile. The material in here is too big to use straight away. Sometimes it becomes firewood, or just gets burned down to “bio char”, or parts will eventually breakdown and get put on the other piles. 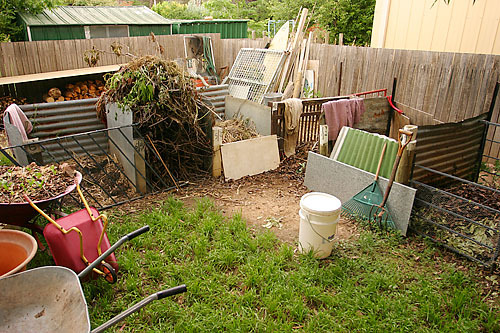 These piles are at the back of the garden and form one edge to the chook enclosure. It is out of the way, but we enjoy this part of the garden as much as any other and often have afternoon tea nearby! Behind them is the “useful box” where all potentially re-useable material, and firewood is stored for later use. The un-mentionable compost is also kept behind these piles – the dog poo compost. 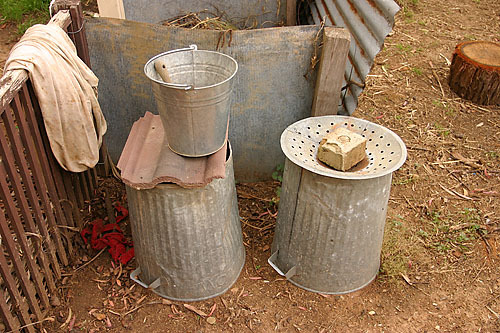 Two inverted bins are used to compost the dogs poo. (two dogs make alot!) One is breaking down while the other is added to. When both are full the old one will be down to less than half volume and is used to make a special dog poo only compost pile, which we use on non edible plants and gardens, mostly in the front garden. The poo breaks down completely and appears and smells just like earth, but could contain some pathogens still, hence the non edible garden use. 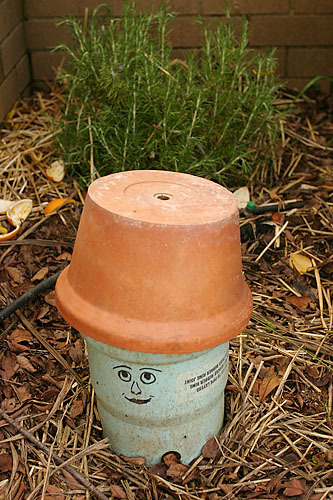 We also have mini compost tubes, like little worm farms. These are dug into the ground in the vegi patches and near trees. Started with some worms and compost from the main piles, they are topped up every now and then with kitchen scraps. Large holes below ground level allow the worms to come and go in the ground around the tube. We like the little hats and faces too! Compost, gotta love it, in all forms. We’re happy not to throw out anything which could be used again.